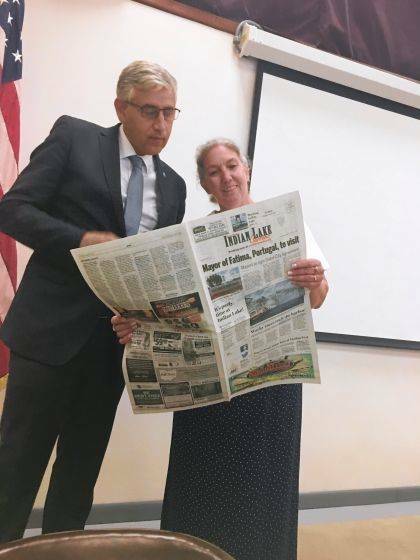 Mayors Luís Miquel Albuquerque and Robin Reames read an article in the Indian Lake Current about plans to sign a Sister City Agreement. It was a real international moment of diplomacy and cultural exchange at the Russels Point municipal building Aug. 10. As the distinguished mayor of Ourem/ Fátima, Portugal, Luís Miquel Albuquerque addressed the crowd in Portuguese through his translator, it became readily apparent to all in attendance that what was going on was a special day and a big deal for Indian Lake. Mayor Albuquerque had flown in with his entourage, including his translator since he speaks Portuguese and not English, to sign an important and historic Sister City Agreement with Mayor Reames of Russells Point. For a second, it felt like the Dayton Accords or an international treaty signing was taking place in Russells Point. Although, neither of those, it was still a very momentous, historic event and important day in the storied history of Indian Lake. After all, it was only just last year the Mayor of Fátima welcomed the Pope himself to Fátima Portugal and over 1 million people were in attendance. Who knows, with this Sister City Agreement now in place maybe Indian Lake will be in line for a Papal visit. Wouldn’t that be something! The Sanctuary of Our Lady of Fatima in Portugal is one of the largest religious tourist sites in the world and had 9.7 million visitors last year. It is such a historic and religious magnet that 12 other countries in the world have Sister City agreements with the city of Fátima. Russells Point is now the only city in the United States that has a Sister City Agreement with Fátima Portugal. That is a big deal! The Our Lady of Fatima Shrine at Russells Point is one of the tallest statues of the Virgin Mary in the United States. Dedicated in August 1964, the 43-foot monument includes a 19-foot by 6-inch fiberglass statue of Our Lady of Fatima on a concrete pedestal. It is located at St. Mary’s Point, 261 Chase Ave., Russells Point. Following Friday’s historic signing, on Saturday, Aug. 11, at 6 p.m, the annual Feast of the Assumption Mass was celebrated by the Most Reverend Joseph R. Binzer, Auxiliary Bishop of the Archdiocese of Cincinnati at the Our Lady of Fatima Shrine on St. Mary’s Point, overlooking Indian Lake. At the time, Mayor Luís Miguel Albuquerque, of Ourem/Fatima was recognized at the mass. It was the first time since the shrine was built in 1964 that an official representative from Fátima has visited the site in Ohio. “I want say thank you for the hospitable way we have been received here at Indian Lake and a special thank you to the Quatman Family and the American Society of Ephesus. I believe this will be a great partnership to achieve great results in cultural, religious, economic and tourism exchange and development,” he added. According to Mayor Reames, this sister city idea started in early 2016 through an impromptu conversation between longtime friend Jim Reed of Indian Lake and herself. At that time Mr. Reed shared how George B Quatman, who erected the Shine of Our Lady of Fátima on Saint Mary’s Point in 1664, loved Indian Lake. “He also shared that the Quatman Family had an interest in Russells Point establishing a Sister City relationship with Fátima, Portugal. From that moment I have been thrilled with this notion,” added Reames. Correspondence began and continued to include the Mayor and Fernando Paquim, Chief of Economic Development and Tourism for the Municipality of Ourem. In 2017, Mayor Reames and her husband attended the International Congress of Religious Tourism and Pilgrimage through the generosity of the American Society of Ephesus. Prior to their journey across the Atlantic, the village council approved a Resolution (17-893) that authorized the Mayor to enter into a memorandum of understanding for the establishment of a Sister cities relationship between Fátima, Portugal and Russells Point Ohio, on October 16, 2017. During their visit to Fátima they presented the resolution to the Mayor for his council’s consideration. And the rest is now history. The American Society of Ephesus Inc. (George B. Quatman Foundation) is a non-profit private foundation formed in 1955 and based in Lima, Ohio. Its mission is to promote a greater realization and appreciation of the teachings and wonders of God; to preserve and erect religious shrines; and to restore and preserve the burial grounds of outstanding religious leaders. In attendance at the momentous Sister City signing was Russells Point Mayor Robin Reames, Ourem/Fátima Mayor Luís Miguel Albuquergue, Mr Fernando Paquim, President of the American Society of Ephesus Mr. George (Bill) Quatman, Vanessa Quatman/Damschroder , 6 Council members and many community leaders and residents.